Hello lovely readers - and how are all of you? Have you heard of NaNoWriMo? If you haven't, NaNoWriMo stands for National Novel Writing Month. It is a program designed to get people writing. It is held every November and the goal of the NaNoWriMo is to just write - every day - for 30 days - in an attempt to get at least 50,000 words of a novel on paper. 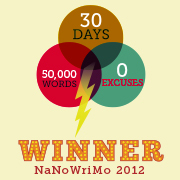 If you manage to write 50,000 words you are a NaNoWriMo winner! What do you win, you might ask? You win a 50,000 word (or more) novel (or portion thereof) written by you in 30 days! What an awesome achievement! As some of you might know I have been bouncing some ideas around for a long time, because I really want to write. I have always wanted to write. This blog helps some, but I've really wanted to write a novel. The problem for me is that I really thought I needed to have a complete outline written before I could sit down and write a book. Isn't that what we've been taught? You need to outline your characters, your major plot points, etc., then you get get down to business. I've never been able to do that. Nope. Never. I nearly decided I could not participate in NaNoWriMo like I wanted to this year because I just didn't have all that nailed down. But I made a decision. I wouldn't worry about all that. I would just start with the vague story idea I had in mind and I would sit down everyday and write SOMETHING. Anything. Guess what? That worked for me. I sat down with a vague story idea and the general genre of the story I intended to go with. On November 1st I wrote about 1500 words or so. On November 2nd I did the same. By the end of the first week I found that the story I had thought I started with wasn't quite what I was writing but decided that was ok, and I'd just see where this lead. You'll never guess what happened next. As I kept writing I found out that I wasn't writing that original story at all. My novel took me in a completely different direction and turned out to be a completely different genre than I had intended. But what is even better is how much I enjoyed the experience. I found myself starting out everyday needing to write more because I wanted to find out what was going to happen next. I didn't even know myself. For me, the process turned out to be like reading a really awesome suspense novel because I couldn't see what was coming. I just knew I needed to sit down and let my imagination go. Now that November has ended and I have won the 2012 NaNoWriMo, I have the bonus of having written something that, while really rough right now and in need of some heavy revision - especially in the beginning before I let myself just write - well is something that I am really proud to have written. Will I publish it? I may. Like I said, at this point it does need some revision, but after some further work it could be worthy of self-publishing. So watch this space for further updates on my novel. It is called Lifeboat. And if YOU participated in NaNoWriMo - I'm very proud of you. And if you WON NaNoWriMo in 2012 - CONGRATULATIONS! I hope you enjoyed the experience as much as I did. If you did, tell me a little bit about what you've written this November and what the experience was like for you. I'd really like to know. I loved doing NaNoWriMo. It was my first time, and it really forced me to make the time in my schedule to let my imagination run wild. My book didn't change as dramatically as it sounds like yours did, but everyday did bring new perspectives on the characters and subplots that constantly surprised me. I think the biggest thing NaNoWriMo did for me was show me what I was capable of doing if I put in the time and effort. Out side of WriMo, I never would have thought I could write 50K in a month. Yet, broken down into pieces, it is totally doable. Hi Stephanie - I'm glad you enjoyed your experience with NaNo as much as I did! If you don't mind, why don't you tell me a little bit about your book? Will you publish it? I had a very similar experience with NaNoWriMo! After I finished my 50,000 words, I decided that I really loved the experience -- so often before when I've tried to write novels, I've gotten so bogged down in the planning that by the time I actually sat down to write, I'd already be kind of sick of the story. NaNoWriMo really was a way to keep my writing fresh and interesting -- I ended up with something that was much more like a book that *I* would want to read! Wow! So I'm not the only one who experienced it that way. That is wonderful to know. Thanks for sharing! Now what will you do with your book? Are you going to publish it?